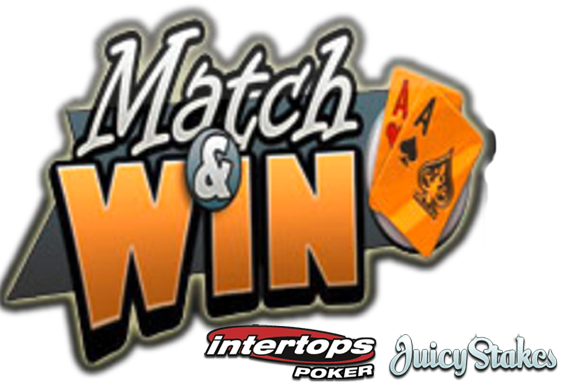 Exclusive tickets to tournaments with prize pools of between $100 and $2,500 are on offer in the joint Match & Win Gold Card event from Intertops and Juicy Stakes Poker. The Gold Cards can be awarded anytime a players sits down at the sites' tables. Players awarded Gold Cards can then exchange them for seats in the special tournaments which will run from 8 September until 7 October. Competitors can see when their cards are valid by going to the rewards tab and clicking on any listed Gold Cards. Instant entry is also available. The Match & Win campaign sees any two or three Gold Cards able to be redeemed for a ticket into a $100 freeroll while any ten, J, Q, K or A cards can be exchanged for tickets into a $2,500 freeroll. Both Intertops and Juicy Stakes are marking the start of Match & Win by offering players a 100% reload bonus of up to $100 this weekend. Satellites for the forthcoming Caribbean Poker Tour are also up and running at both Revolution Network sites.